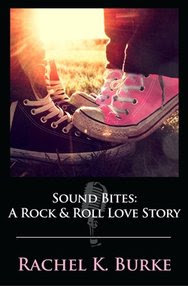 If you love rock and roll romance and have a weakness for bad boys, you'll love Sound Bites! Renee Evans has a knack for trouble. After walking in on her best friend and boyfriend in bed together, twenty-five year-old Renee flees sunny Los Angeles and her dream job as a music journalist and returns to her hometown of Boston – only to meet Dylan Cavallari, the mysterious, aspiring musician who lives in her apartment building. Dylan's piercing gaze and womanizing demeanor make him exactly the type of guy that Renee should steer clear of – which is most likely the reason she falls for him. But when Renee's troublesome ex comes back and threatens to drive her and Dylan apart, Renee is forced to face her past and save her relationship with Dylan before it's too late.